Pâté’s are a full-flavored gourmet cuisine enjoyed by food lovers all over the world. 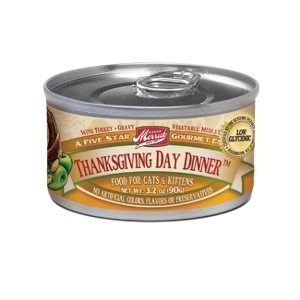 This international favorite is sure to please your feline family member, as well. 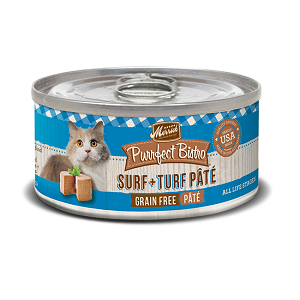 Made with love from our kitchen and featuring deboned beef as the first ingredient with deboned salmon, Merrick Grain Free Purrfect Bistro Surf & Turf Pâté contains no artificial colors, flavors or preservatives. It does, however, contain a delightful recipe that your cat will love. 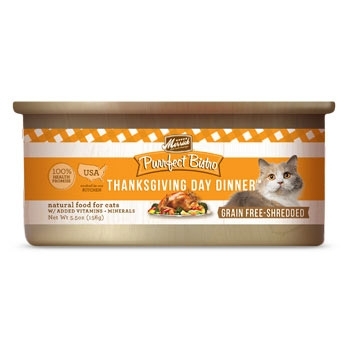 Merrick Thanksgiving Dinner Can Cat 24/5.5 oz. A nice snow fall has blanketed the ground and friends & family have traveled from miles around. The house is Filled with the wonderful smells of Thanksgiving. Merrick Grammy's Pot Pie Can Cat 24/5.5 oz. No one can ever forget the sensational aroma of Grammy’s kitchen and her renowned chicken pot pie. Grammy’s two Siamese cats are around her feet hoping for tidbit to fall off the cutting board. 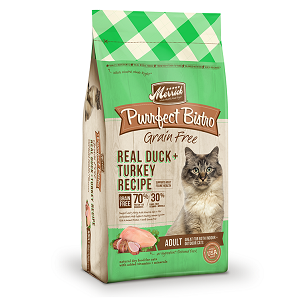 This delicious version of a French classic will convince your cat they are dining in the finest restaurant with ingredients like tender chunks of tuna, peas, cranberries, green beans, and anchovy. 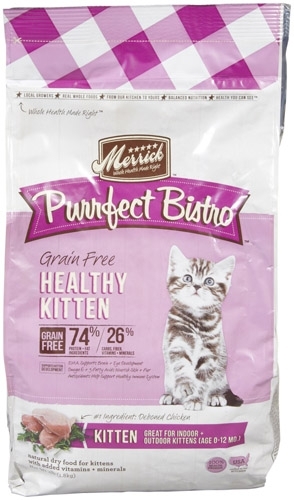 The satisfied purrs you hear after serving this dish will translate to a happy "Merci!". 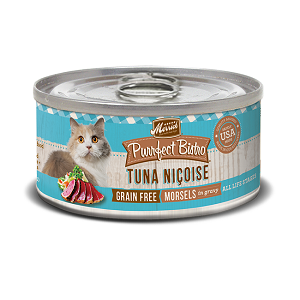 Merrick Grain Free Purrfect Bistro Tuna Niçoise Canned Cat Food contains no artificial colors, flavors or preservatives. It does contain tender slices that your cat will love. 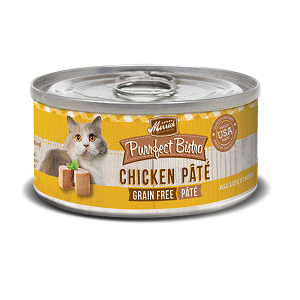 Pâté’s are a full-flavored gourmet cuisine enjoyed by food lovers all over the world. This international favorite is sure to please your feline family member, as well. 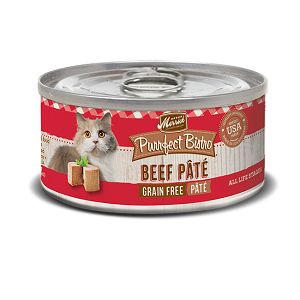 Made with love from our kitchen and featuring deboned beef as the first ingredient, Merrick Grain Free Purrfect Bistro Beef Pâté contains no artificial colors, flavors or preservatives. 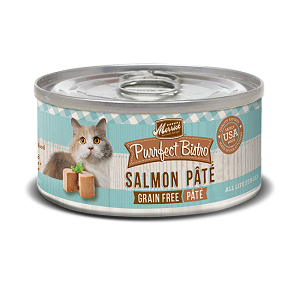 It does, however, contain a delightful recipe that your cat will love. The smell of Grammy's house and her famous chicken pot pie is an unforgettable comfort. 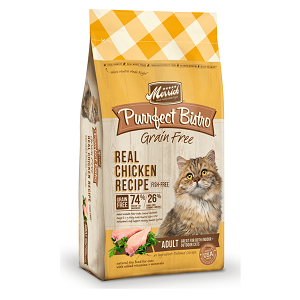 We're happy to share this tasty recipe so your favorite feline can enjoy it too.